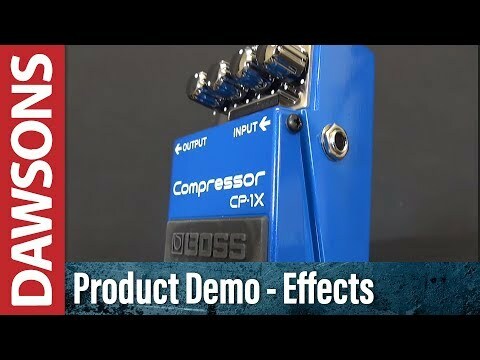 The Boss CP-1X is an incredibly designed Compressor pedal using Boss MDP (Multi-Dimensional) technology. This multiband compressor can work with any guitar, even seven- and eight-string models as well as electro acoustics, making it a well worthy addition to your collection. Boss have expertly crafted the CP-1X to stand out among any other similar Compressors. Thanks to Boss' MDP technology, the CP-1X uses real time to accurately and naturally compress the tone of your guitar, making it versatile and adaptable for your chosen instrument. Whichever guitar you choose to play using the CP-1X, the overall tone delivery is second-to-none, giving each nuance and note added definition. The CP-1X enables you to alter from playing funky sounds to country-style chicken pickin', whilst giving your output an extra boost. For guitars with seven or eight strings, this pedal works on controlling the highs without dirtying the lows. The controls on the CP-1X may appear simple, and they are definitely easy to use, however there is more to each individual control than meets the eye. There are four controls for Level, Attack, Ratio, and Compression. As you tweak each control to shape the tone of your guitar, beneath the body of the pedal their parameters lock together simultaneously. Boss' MDP processing technology calibrates and improves the tone despite such simple controls. There is also a 16-segment gain reduction inductor which lights up to show you the level of compression, perfect for use in a dark venue. Boss have incorporated 18-volt input circuitry which widens the headroom to complement your guitar's pickups. Boss have worked to ensure the level of noise is incredibly low in this compression pedal for seamless sound control. The Boss CP-1X Compressor Effects Pedal is expertly crafted to boost the true character of your most favourable guitar.